Pattaya’s Panorama bar helped raise 127,000 baht for an AIDS charity with drag queens and raffles. 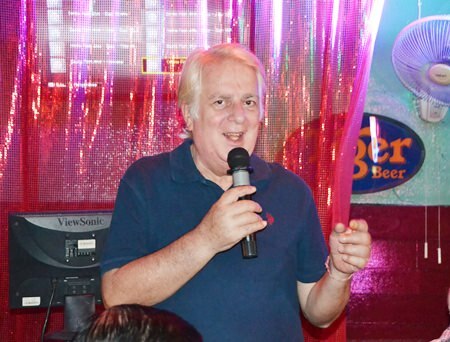 Manager David Kerridge, who started similar charity events while previously managing Le Café Royal, hosted the Nov. 12 cabaret night headlined by British drag queen “Davina Sparkel.” He entertained a packed house with musical numbers interspersed with bawdy humor. The beneficiary for the evening was the Heart2000 foundation headed by Dr. Philippe Seur, who appeared at the party despite suffering from dengue fever. Heart2000 works with 2,043 HIV and AIDS patients to fill the gap between government health insurance and the care they need. In all, more than 172,000 baht was collected through donations and a raffle, with the grand prizes being a motorbike and a gold chain. 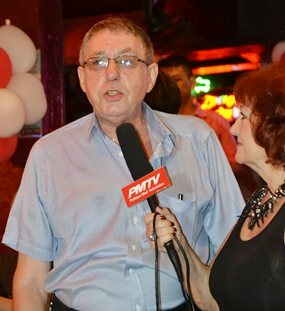 David Kerridge, one of the managers of the Panorama, is interviewed for PMTV by Elfi Seitz. Dr. Philippe Seur addresses the gathering, thanking people for their help in the fight against AIDS.